Eric Rill wastes no time grabbing readers in his new novel, The Window Washer. The book opens with a dramatic crime scene where the protagonist, Nick Grant, learns that his wife has been killed and his son hospitalized after a fire engulfs his father’s home where his family has been staying. His son soon also dies. The book lags a bit while the author introduces the other characters and sets up their inter-relationships with Grant, and the plot can be dizzyingly tangled. But once everyone is identified and their backstories told, the pace picks up and doesn’t let up until the final page. Grant is the window washer of the title. He once ran the Crown hotel for his father, a Columbus, Ohio hotel magnate who is laundering money for the mob (the Crown is the only hotel owned by his father where no money laundering is allowed). After the death of his wife and child, Grant quits his high-paying, privileged position and becomes a drug addict before getting clean and starting from scratch with a menial job as a window washer. Grant hates his sleazy father and won’t accept his help. While at work, he spies Angela, the mob bookkeeper, counting money, and later tries to help her when she gets beat up by a low-level mobster. The mobster is found murdered, and Angela – and Nick – become potential suspects. The appeal of the novel is that, like Grant, who is not just a window washer, many of the characters are not who they appear to be. The book is peopled by informants, crooked cops and undercover cops, and by the end, part of the thrill is parsing out who is who. In clipped, noir-ish prose, Rill adds unexpected twists that deliver beyond the familiar cops-and-crooks scenario. 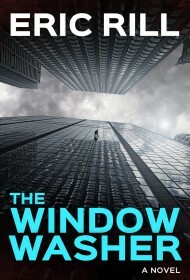 Readers will find an entertaining story in The Window Washer, one that’s a cut above the typical novel of this genre.